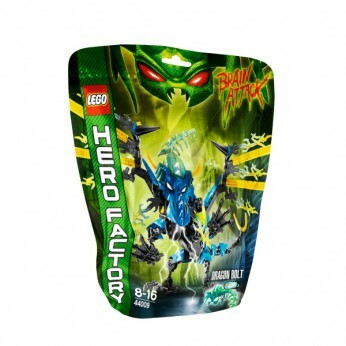 LEGO Hero Factory DRAGON BOLT features removable, multicolored evil brain, big head with powerful biting jaw, flapping storm wings, translucent elements and cool glow in the dark eyes…. With its big head and dangerous biting jaw, powerful flapping storm wings and razor-sharp tail spikes, you’re going to need all of your skills to defeat this flying nightmare! LEGO model number: 44009: The evil brains have transformed a dragon-like creature into the snarling, ferocious Dragon Bolt. For ages 8 years and over; EAN: 5702014974647. WARNING(S): Not suitable for children under 3 years old. To be used under the direct supervision of an adult. Prepare for takeoff, heroes! The evil brains have transformed a dragon-like creature into the snarling, ferocious DRAGON BOLT! With its big head and dangerous biting jaw, powerful flapping storm wings and razor-sharp tail spikes, you’re going to need all of your skills to defeat this flying nightmare! This toy costs approximately £17.99 (for the latest and best prices make sure you check our retailer list for the LEGO Hero Factory Dragon Bolt 44009 above). In our review of LEGO Hero Factory Dragon Bolt 44009 we classed it as being suitable for ages 6 years, 7 years, 8 years, 9 years, over 10 years but recommend you check the manufacturer specific advice before purchasing.